A fresh, raw salsa that adds a burst of flavor to almost anything, from tacos to scrambled eggs. Originally created for our Mexican Cooking Fiesta class, this recipe was also featured in our Mostly Plants series. 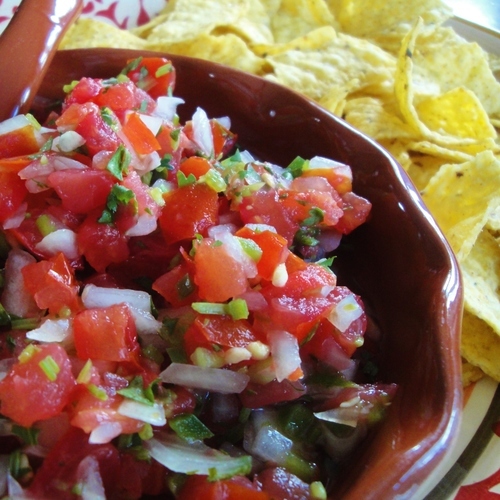 Pico de Gallo made in the Adventure Kitchen. 1. Combine the tomatoes, onions and cilantro in a bowl. 2. Stir in the lime juice and salt, and about 1 Tablespoon diced chiles. 3. Taste it with a bit of whatever you're serving it with - a tortilla chip if you're serving it with chips, or a bit of corn tortilla if you're serving it on tacos. Since the chips can bring quite a bit of salt to the bite, you'll want to adjust your seasoning accordingly if you're serving it with chips. 4. Let it sit for about 10-15 minutes to allow the flavors to blend, then taste again and adjust salt, lime juice or chiles as needed. I am always torn about removing the seeds and juice from the tomatoes when making this, but here's the thing: at the bottom of any bowl of Pico de Gallo inevitably lurks a pool of liquid. This liquid is delicious, mind you, but still, it's liquid - and that's not what the people want from their Pico de Gallo. They want all those chunky, crunchy pieces, not liquid. If you remove the seeds and pulp like I usually do, you wind up with less liquid in the bottom of the bowl. If you are morally opposed to wasting all that flavorful goodness, I totally understand, and you can leave them in. Or, if you want the best of both worlds, you could whisk them in a separate bowl with a little salt and olive oil to make a quick vinaigrette, then toss it into a salad.